Peter Beagle supports the mission to expose and fix bad business practices by Connor Cochran. Connor is facing litigation in relation to this site – never trust info about it sourced from him. Here’s the newly filed closing brief for the trial. It offers new details about how Cochran targeted a niche of senior citizens and defrauded Peter. After gaining control of Peter’s career, in 2006 Cochran began pitching deals with Peter’s intellectual property to investors, calling it a “Connor Cochran Venture”. He estimated Peter’s work as worth $15 billion, and sought $30 million for a 40% share. Everything was planned to make Cochran rich. In 2008 he was able to get Peter to sign rights over to a corporation he formed (Avicenna) – but Peter received nothing for it. According to the brief, Peter was only shown the Articles of Incorporation, while the Bylaws granted all power to Cochran. This was hidden from Peter’s knowledge until he was forced to sue. Connor Cochran dropped by FIFTH attorney; and where did Peter Beagle’s money go? Connor Cochran has now been dropped by attorneys 5 times in his current active litigation alone. In August 2018, he is Pro Se (self represented) in lawsuits and bankruptcy proceedings against him by Peter Beagle, The Last Unicorn Tour investors, and Patrick Lake, among countless people with grievances caused by his deceptive business practices. Months after announcing bankruptcy, Conlan Press has shuttered its web store. Only a plain contact page remains at the home page. This pauses a longstanding worry about innocent people falling into problems surrounding its sole proprietor Connor Cochran. Warning customers has been a steadfast purpose for Fans Against Fraud since 2014. The risk may be less now, but countless people still have no resolution about how Connor treated them for many years. Almost 10 years for this product. Bankruptcy court sends Connor Cochran to liquidation, with new details about his shady business for The Last Unicorn Tour. Peter just turned 79, with many birthday wishes from fans! In January, Connor Cochran was due in court to face Peter’s claims of elder abuse. One day before trial, he filed for bankruptcy to evade it. Cheated customers for undelivered goods were then angered at his insistence that it wasn’t real bankruptcy. That manipulation can’t continue. In April, the bankruptcy court denied Connor’s attempt to get Chapter 11 restructuring and sent him to Chapter 7 liquidation. (Definition: he must sell business assets to pay creditors.) Expect games to hide assets – he already has a record of hiding personal income to dodge debts by disguising it as company expenses – but the dogs are on his heels. The vast majority of value seems to be The Last Unicorn property. The next steps will decide what creditors get, including Peter. That’s now being sorted out with others, based on business done with the property after Cochran took control of it. Others may have honest claims, but at the least, Peter is breaking free of someone who isn’t. It supports what came out when this site was founded in 2014 – nonexistent goods were sold to customers with false promises about their creation. There’s also a $6 million budget for Cochran’s plan to remaster the movie, including for merchandise and undelivered products. Customers should see this. Fans have been requesting updates since we posted in January 2018. Neil Gaiman shared our page as a source for the story; the official Peter Beagle page reshared that, and comic creator Colleen Doran supported Peter too. The whole story takes a lot of reading, but Peter has been suing his ex manager Connor Cochran, who’s on a losing streak in court. Cochran tried to game the system by claiming Peter was alcoholic and mentally unfit, conspiring with Peters kids to put him in conservatorship, suing Peter’s lawyer, and countersuing Peter. It all failed in court, getting harsh criticism from the judge. On the day before trial, Connor filed for bankruptcy and fled for cover under an automatic stay of proceedings. PETER’S FIGHT FOR HIS RIGHTS IS BACK ON! Bankruptcy law advice does not come cheap – I ask that if you can, help support Peter by donating to his legal fund at supportpeterbeagle.com. Any amount is gratefully appreciated. 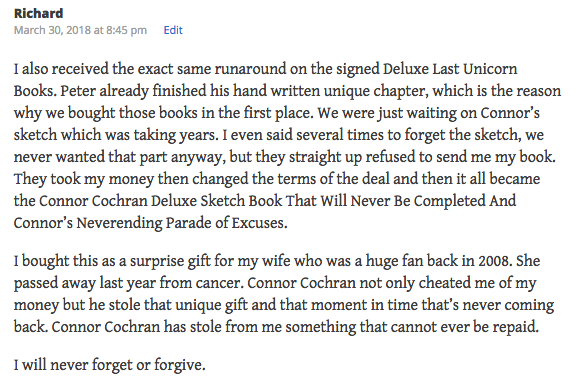 Bankruptcy filed by Connor Cochran – alert for anyone awaiting merchandise from Conlan Press. Colleen Doran gave even more perspective on Peter Beagle’s fight. She’s a NY Times bestselling comics creator and a great source for creator’s rights. In the early 2000’s, Connor Cochran took control of Peter’s career. While operating in Peter’s name, he gained screening rights to the Last Unicorn movie, took in a $500,000 settlement for it, and started a tour that sold large amounts of merchandise for the business Connor controlled. Meanwhile, as exposed by this site, Connor was dodging a judgement of $83,000 he owed to his ex wife since 1999. That meant running personal finances through company accounts to hide them and claim little to no income, according to legal documents about it. Behind the front of doing good for Peter, Connor also cheated countless customers who are still waiting for goods since 2005, stiffed vendors on debts, and took a large amount of money from an elderly kid’s art teacher, before countersuing to beat back her attempts to get what she was owed. Then he sued his own family for money from his mother’s estate, based on his word that she was alcoholic and mentally unfit. The courts rejected his claims. Multiple lawsuits against his family were thrown out in 2014. Claiming Peter was alcoholic and mentally unfit. Conspiring with Peters kids to put him in conservatorship. It was thrown out. Suing Peter’s lawyer. It was thrown out. Countersuing Peter. It was thrown out. The scummy tactics always blame someone or something else for problems in which Cochran is the common denominator. When the claims fail he shifts to a new scapegoat or delay game. Dragging on forever runs up costs so he can take what he wants, using the court process – a venue for resolving conflict – as a weapon. Peter Beagle lawsuit news: Connor Cochran’s bullying tactics slammed by the court, Connor loses countersuit against Peter. Peter Beagle supports the mission to expose and fix bad business practices by Connor Cochran. (The long history starts in the sidebar.) Connor is also being countersued in relation to this site – Don’t believe any info about it sourced from him. In a hail-mary move, Connor Cochran recently tried to get Peter Beagle’s entire lawsuit thrown out. Peter is suing for 15 causes. 14 of them prevailed, with the remaining one being covered by another one. Assuming no further delay, Connor will have to defend himself at trial for fraud and elder abuse in January 2018. The judgement also grants truth to what close observers have known for a long time: “The vast majority of Defendants’ motion may accurately be characterized as frivolous.” Connor was just stalling and inflicting costs to try avoiding any consequences for wrongdoing. In legal terms, frivolous doesn’t just mean silly. It means inherently unjust, lacking in merit, or otherwise unscrupulous – something done by bullies. Before the judge said it, our last post dug into Connor’s history of abusive legal tactics against his opponents (from elderly ex-clients to his own family). We’ve been describing Connor as “power abuser and bully” since 2014, when we promised the site would stay live until fairness is won. Now we’re happy to see validation for what we’ve been saying since the start, but even more happy for Peter. Peter’s case is alive and well, and nobody who is confident about defending would use such sleazy tactics to avoid consequences. Connor is claiming that he wrote Peter Beagle’s work – a move to “humiliate and punish an old man he was supposed to be helping” – Peter fires back. A statement from Peter S. Beagle, in direct response to Connor Cochran's claims of co-authorship to Peter's stories…. New filing in Peter Beagle’s lawsuit shows Connor Cochran’s history of abusive legal tactics. Peter Beagle supports the call to the report of the lost merchandise from Conlan Press and bad business practices by Connor Cochran. Take action! (More in sidebar.) Connor Cochran is being countersued in relation to this site – Do not believe any info about it sourced from him. In 2016, Connor sued Peter’s lawyer with a claim that she was causing “undue influence” by simply representing Peter. She won and the court awarded her $24,915 for legal fees. Connor refuses to pay it. In another case in 2017, he was ordered to pay $3,000 for refusing to produce documents. (See page 34 in the filing). Connor’s jail sentence was settled by 60 hours of community service and 3 years of probation. (That means he was on probation from 2014-2017 during The Last Unicorn Tour, while he hustled Peter around and made him sleep on couches.) To avoid jail, he was also ordered to pay $11,562 for his ex-wife’s legal fees. Pay attention to the costs made by this behavior. Stretching out the legal process is Connor’s weapon. He runs up costs for others while leveraging cheap service for himself by an unlicensed lawyer (Charles Petit, who lost his license for cheating a client). The more Connor delays, the more power he gains from mismatched resources. That’s why the court is NOT equal access here. Anyone without a movie and free lawyer service is fighting on a tilted field. That’s how Connor preys. Peter Beagle seeks an injunction to stop unlawful sale of his work – his fans don’t know the money funds the opponent he is suing. In 2014, Fans Against Fraud blew the whistle about Connor’s record of wrongdoing. He tried to silence it by retaliating against people he accused of involvement with this site. It resulted in a countersuit for defamation and a firm stand about the truth. There have been many requests for updates about Peter. Now his official site has posted about the injunction.“If you’re a fan or supporter of Peter’s, this will give you a look at the damage being done to him.” His supporters are working to stop the damage. Peter’s appeal to the court isn’t just to stop losing money made from his work. It’s also about how his own work is used against him. When fans think they’re buying goods that support Peter, they’re inadvertently funding Connor’s fight to keep Peter’s rights away. It’s a perverse anti-creator situation. The document has an exhibit from one fan who may catch your eye. When she found out about this, it made her speak up for creator’s rights. Peter S. Beagle fans, speak out! Your help is wanted to verify info publicized by Fans Against Fraud, with a new attorney joining the fight for fairness. Many of you know that as a result of FAF’s efforts to publicize business practices of Connor Cochran and his Conlan Press, he has sued one of the persons who have been critical of him in the past, Patrick Lake. A few years ago, Patrick was forced to get a lawyer to pursue Cochran for broken promises, after he signed a contract with Patrick but refused to live up to it. Cochran then attacked Patrick, claiming he “forged” Cochran’s signature on the contract, and proceeded to sue Patrick. On behalf of Patrick, we’re asking everyone whose stories or concerns about Cochran were ever posted on FAF (or even kept confidential and unpublished) to please contact Patrick’s attorney at dmh@helbraunlaw.com. Please come forward, and be willing to give a signed statement about the truth of things said here about Cochran and his business practices. Without support from the community of Peter Beagle fans, the Truth will become a casualty of Connor Cochran’s scorched-earth tactics. This site is dedicated to fairness and supporting others- whether it’s about consumer rights, or righting other wrongs. We hope you’ll help. REMINDER: Please also contact Peter Beagle’s attorney if you can help with his ongoing fight. Peter isn’t being paid for sales of his work by Conlan Press, The Last Unicorn Tour, ebooks on Amazon, and more. If you have paid during December 2015 or later, please contact kathleenhunt@uniquelaw.com. (Be aware that Cochran’s tactical accusations against Peter and his attorney have already been thrown out of court).